The Premis Contemporary in iron black. That product is the Premis Contemporary, Kwikset said, simply a cosmetic redesign of its existing HomeKit-ready lock, reviewed by AppleInsider. The original Premis is battery-powered, and lets homeowners control a door via Siri, app, key, or touchscreen. Two Wi-Fi-enabled Halo locks are due to launch sometime in 2019, one of them with a physical keypad and the other a touchscreen, like the Premis. At least initially digital control will be through a new Kwikset mobile app with features like access permissions, history, and a cloud service -- Kwikset has promised support for "other smart home product and system providers" though, which could theoretically mean HomeKit, Amazon Alexa, and/or Google Assistant. 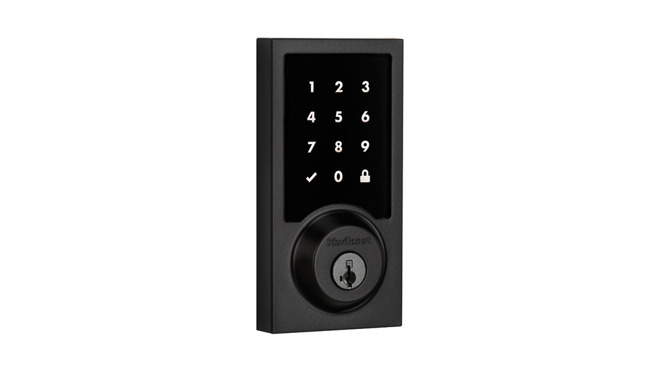 The touchscreen version of the Kwikset Halo. The Halo Keypad Wi-Fi Smart Lock will cost $199, and come in satin nickel and Venetian bronze colors. The Halo Touchscreen Wi-Fi Smart Lock will be $229, and sold in chrome, satin nickel, iron black, and Venetian bronze. 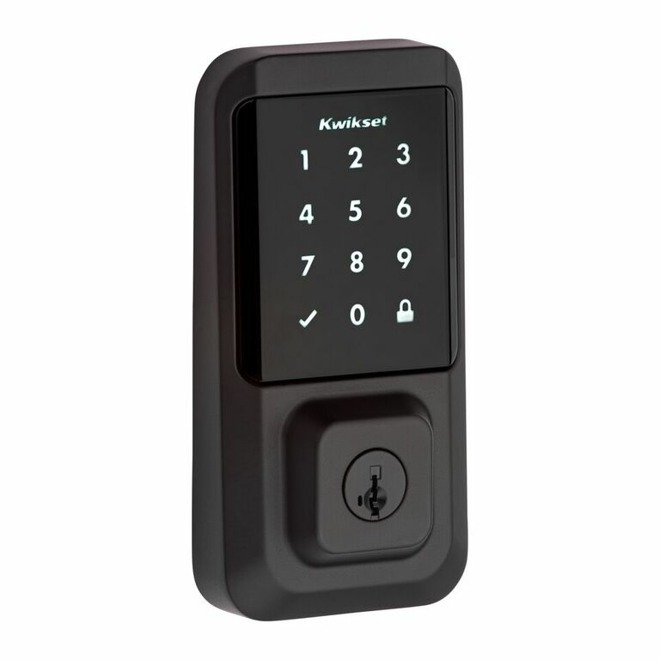 The Aura uses Bluetooth instead of Wi-Fi, limiting its range, and comes with a physical keypad only. There appear to be no plans for platform compatibility beyond the future Kwikset mobile app, but the tradeoff is a cheaper $149 pricetag. It should ship sometime this year in satin nickel, Venetian bronze, and iron black. The Kwikset Aura in Venetian bronze. For those who have mobility issues I see some important benefits to these locks, but I do wonder if deploying them opens up homes to security risks that are any greater than an intellicode garage door opener. For the WiFi version, can a remote user or someone on the street hack in to your house? Some network based security cameras for example have been shown to have so-so security. Do we feel confident that traditional physical lock companies really have the tech chops to have done it right? Of course a brick through a window or use of a crowbar are perhaps the oldest forms of security hacks, although they capture more attention. Proper securing of ones local network and WiFi router becomes even more important with these locks. It is amazing that none of the smart lock companies have found a way to power the devices without having to replace the batteries all the time. Reading the reviews of smart locks the biggest complaint is that the batteries only last a week or two. That is a problem for many HomeKit devices. For example window shades, alarm systems, and all sorts of cameras, sensors and monitors, etc. Unless the home was prewired to accommodate them it costs too much to retrofit. For example with the exterior door locks, it could take several thousand dollars of remodel work to provide permanent power. In my case I would be reluctant to do it because my front door was custom made and quite expensive. It would be difficult to find a contractor whom I could trust with that sort of unusual project. Besides, until Baldwin makes a morticed-in lock system that is HomeKit enabled, I'm out of luck. I haven't seen even one HomeKit lock that is the least bit attractive. 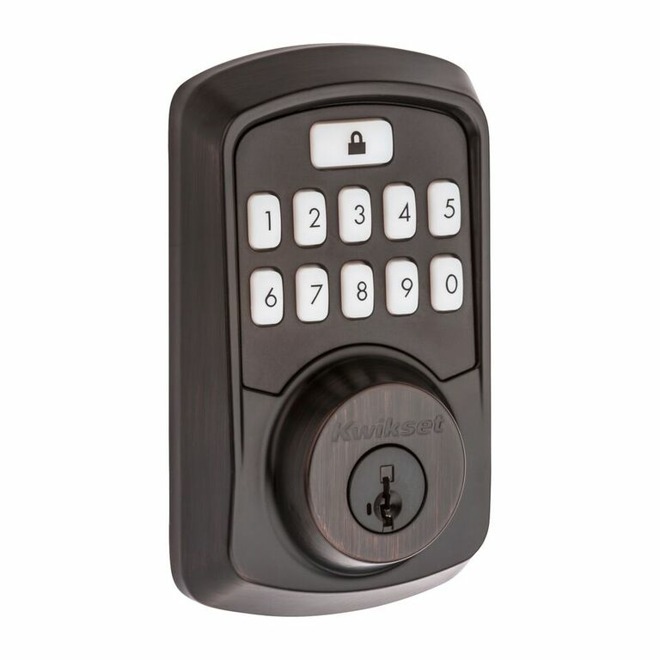 My office has a powered security code system but the powered side is on the jamb side of the door not on the door itself so it is a little bit less complicated to retrofit but smart lock companies don't want to be in the remodel business. They just want to ship it and forget it. I have the Kwikset Premis, use it multiple times a day every day (to/from work for two people, walking the dog multiple times, etc. ), and the last time I changed the batteries was at least 3 months ago. The batteries tend to last 4-6 months between changing. HOWEVER, if you don't install it properly, and the bolt rubs against the sides of the socket AT ALL, you'll be lucky to get a week or two out of the batteries. The first set of batteries only lasted me a week, so I widened out the socket and made absolutely sure the bolt wasn't rubbing. Problem gone. The issue is that any rubbing against the sides means the motor has to work really hard to move the bolt, which obviously burns up the batteries. Frankly, I think it should give a warning tone if the motor is working that hard, although you can hear the difference once you fix your installation. It's good that the motor does what it takes to lock/unlock the door, but a really in-your-face warning that this is killing the batteries would be wise. They might have avoided a lot of bad reviews if they included that feature.